ALL CABINS HAVE A HOUSEKEEPING CHARGE AND COUNTY TAX IN ADDITION TO THE RENT. 3 Night Minimum During Holiday Periods. RECENTLY RENOVATED! This cabin has a level driveway. 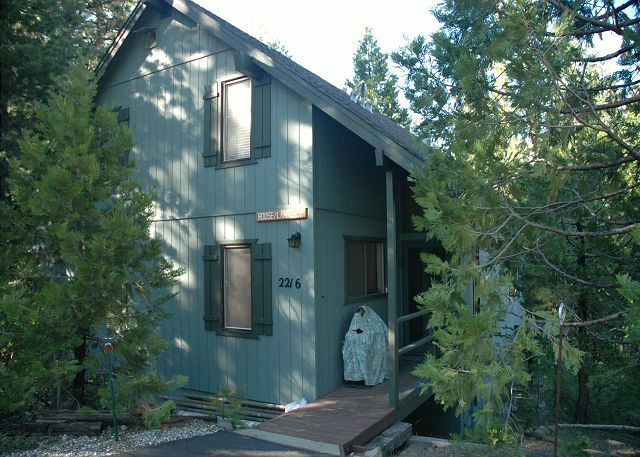 Spacious, comfortable 3 story cabin with modern kitchen, DW , W&D, 3 bedrooms, loft and rec room. Large living room and dining area. Extra large dining table for great entertaining. 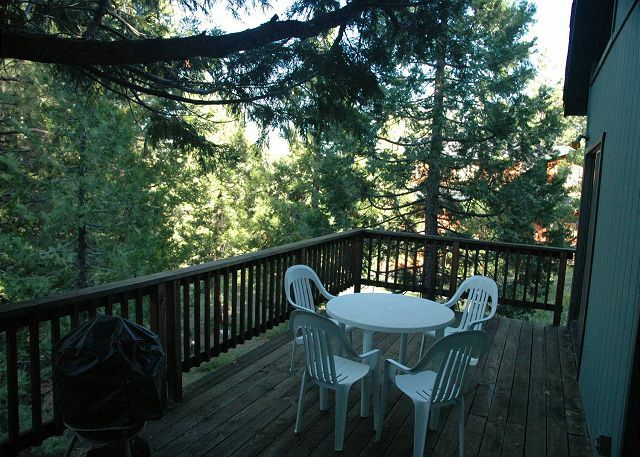 Large deck for relaxation, propane BBQ (for summer use only.) 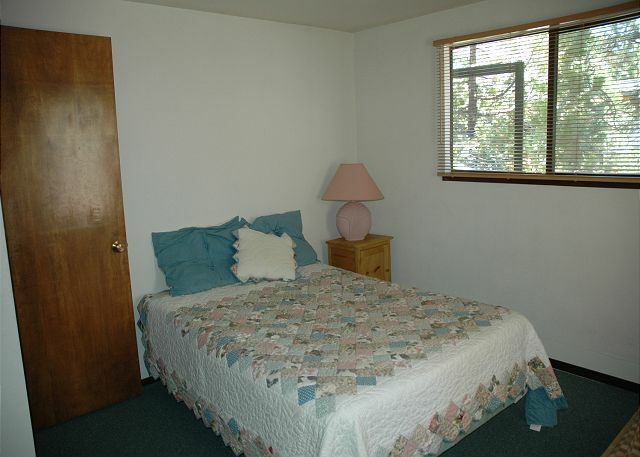 2 bedrooms with queen bed in each on main floor with communal bath. 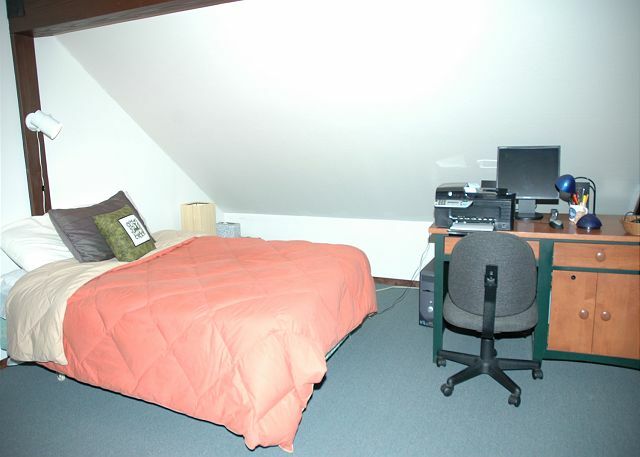 2nd story master bedroom suite with California King bed and full bath, plus loft with double bed. 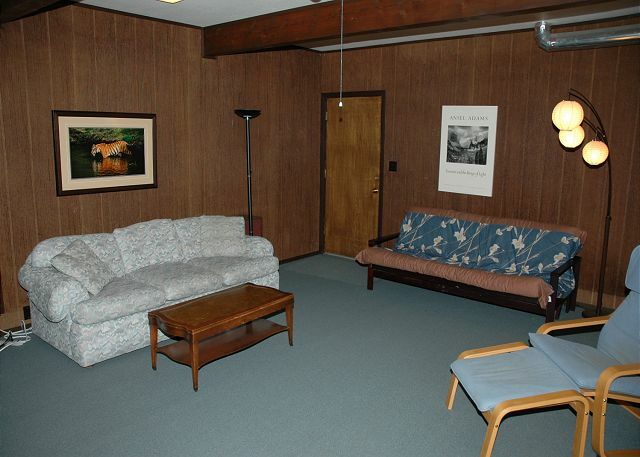 Downstairs recreation room has ping pong table, bunk bed and double futon. Central Heat and modern wood stove. Cable TV in main room and rec. room. Sloped backyard is perfect for sledding in the winter months. Owner provides some snow play items for kids. No smoking, PET FRIENDLY - Dogs OK with prior approval. $25 per-pet fee may apply. 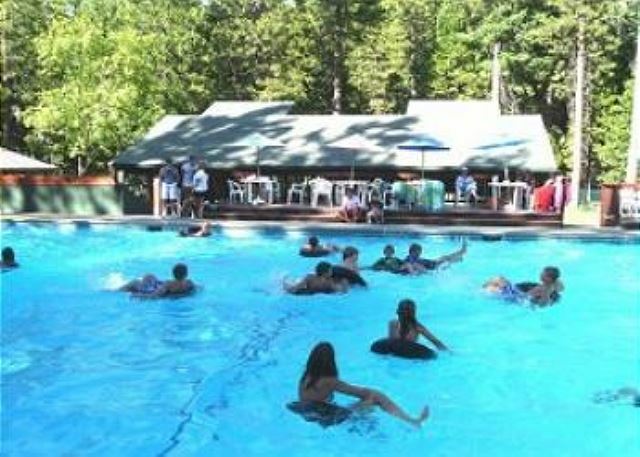 Summer rec center privileges (guest fees apply). Very nice comfy place. Well appointed. Had everything we needed except safety rails on the staircases. Not good for small children. We had to be very careful to keep our little granddaughter away from both stairways. Looks like it would be fairly easy to remedy. We will pass your comment on to the owners. A wonderful time had by all. So sorry you didn't receive my first review. I did answer the first request quickly. We were extremely satisfied in every way. The cabin was very clean and was equiped with every thing we could possibly need. We are so glad you had a good family reunion in one of our mountain homes and hope you can make it again soon. We had a great time at Morell. The cabin and amenities were great. We had a lot of new snow during our stay and the easy access from the road was appreciated, no stairs to access the cabin. Our teenage kids loved the lower level with the full-sized ping pong table. 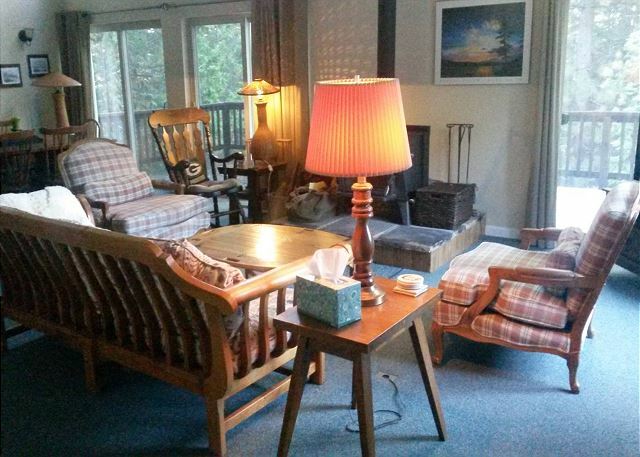 The cabin is clean, well furnished, and comfortable. This is a cabin we will rent again! Excellent. The only problem we found was a broken dining chair. It was great! Great weather! Plenty of space and the ping-pong table in the game room was a bonus! Very glad these guests enjoyed the Morell cabin. The house is quite large and does afford plenty of room for everyone. The beautiful location and game room are always popular with guests. This cabin was great, it was beautiful and clean specially the kitchenis it was well organized easy to clean. The rooms were nice, warm and cozy I love the layout of the cabin because the kids got their own place to play. We really enjoyed our stay here. The level access was especially nice for my wife, who uses a walker. The kitchen and dining area were outstanding, with a very generous stocking of utensils. We loved the view out the dining windows. 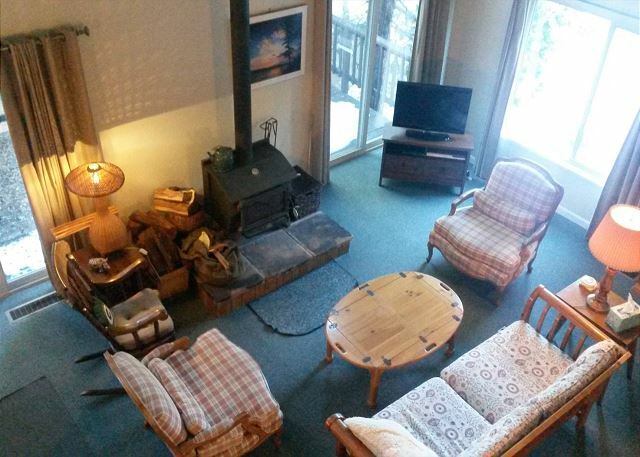 The wood stove made the living room very cozy. My daughter says this is the best cabin we have stayed at. We will definitely come again. We felt like we were staying in a home not a properly rental. Our experience was very satisfying except for the king size bed in the master bedroom. It was an older mattress and very hard and uncomfortable. Overall a very nice cabin! Everything was great. Wish the kitchen had a few more large pots and pans. Otherwise a great cabin. Looking forward to checking out the next cabin. Great time was had by all. Great snow, including in Big Trees for ski and snow-shoe fun. The snow plow was prompt and effective. One suggestion for this house: A music player that has an ipod dock. We were pleasantly surprised! 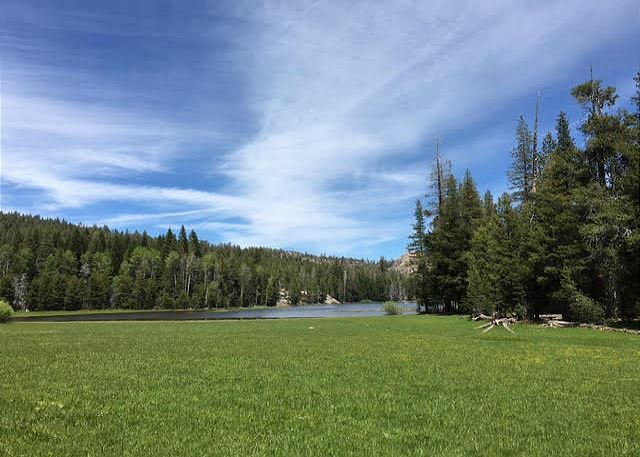 We had originally reserved another cabin, and when that reservation fell through, we were directed to this property. 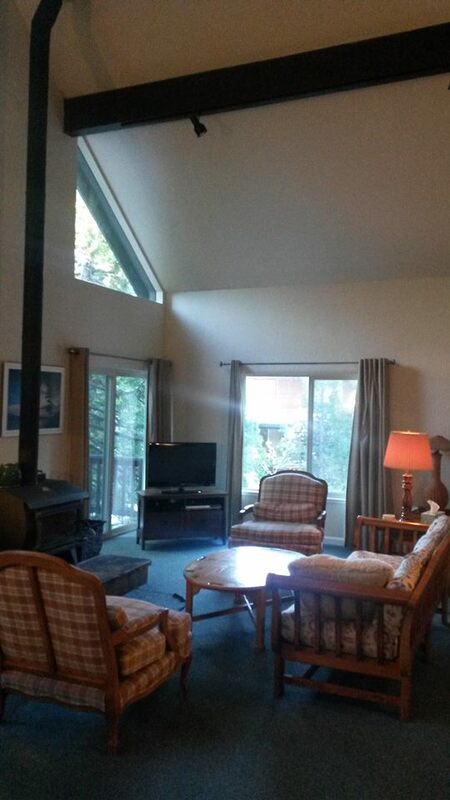 In the photos, the cabin looked a bit outdated, but it had everything we needed. We were very excited when we got to the cabin because it exceeded our expectations - and the power was out for over a day. The wood burning stove worked great to warm the majority of the house (not the bottom floor- but when the heater came on that wasn't a problem). We enjoyed some great sledding all around the cabin and kept our groceries cold in the snow on the porch. The cabin was comfortable and the sleeping arrangements were perfect for our group. I think the bathrooms may have recently been updated - both showers were great! 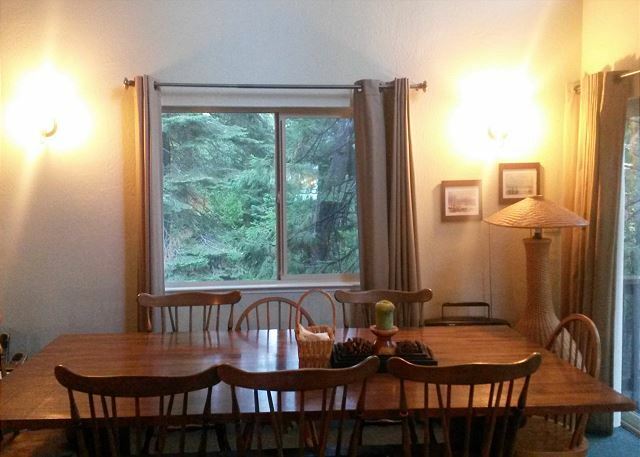 The cabin is also well stocked with sheets, towels, games, and kitchenware (pots, pans, gadgets, spices, etc.) The fact that the cabin had wifi was very convenient because there was no cell service at all in the area. The entrance has a "mud room" that was great for getting kids in and out of snow clothes and boots. All in all, we loved the cabin and had a great weekend.We would definitely recommend this property & we hope to go back another time. This is what coming to the mountains is all about. So glad this family was so pleased--we strive to give everyone a vacation to remember. The adventure of the mountains is a vacation to remember. the bbq started on fire some one did not cleaan it very well. The kitchen was well stocked. There is a problem in the ceiling in the bathroom. The cabin is great for a big group of people. Kitchen wasn't clean upon arrival. Otherwise a reasonably nice house. 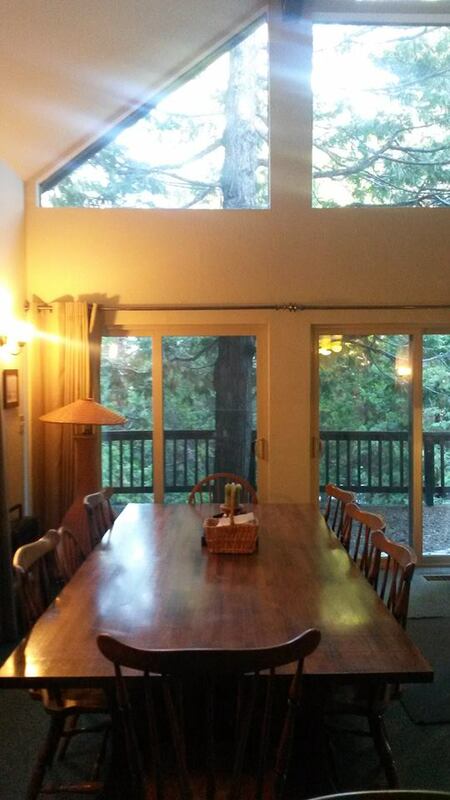 Mothing fancy, but good common space and big dining table for family dinners. We like this house, but we were promised a bigger house and that was lost by management. We squeezed in. We left it clean, but we were charged extra anyway.